This year marks the 25th anniversary of the Eurobike cycle trade show in Friedrichshafen, Germany. What started as a scrappy regional mountain bike trade show has become the world’s finest cycling exhibition bar none. Sprawled across 11 hangar-sized halls and the Zeppelin Hall at the Friedrichshafen Airport next door, Eurobike offers an incredible array of the new bits, bobs and bikes for the coming year. Even if big brands like Trek and Specialized no longer attend, there is so much to see at Eurobike that one hardly notices. Simpson Magazine prowled the halls of Eurobike to bring you this overview of the world’s finest cycling exhibition. Canyon Ultimate SLX Disc: Although the dim bulbs at the International Cycling Union have put the brakes on disc brake trials in the pro peloton, that hasn’t stopped brands like Canyon from moving the technology forward. Earlier this year, Canyon officially launched the Endurace CF SLX and showed the Ultimate CF SLX Disc and Aeroad CF SLX Disc. Pictured here in Katusha team livery, Canyon Ultimate SLX Disc is equipped with SRAM’s new Red eTap HRD groupset. For the Ultimate SLX Disc, Canyon have Zipp 202 wheels with 12mm thru-axles front and rear, with disc calipers attached using the flat mount standard, and internally routed hydraulic hoses. The East End of London was well represented at Eurobike by Brick Lane Bikes. The iconic fixed gear brand is well-known in Germany’s urban fixie scene. Featured at Eurobike was BLB’s full-carbon Aeon frameset. The full-carbon monocoque frame is built from super high modulus Toray T700 carbon fibre with tight geometry, short chain stays and steep head angle. 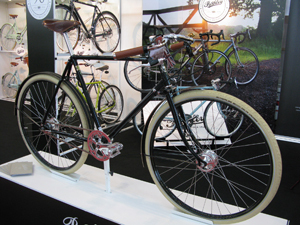 Amongst all the the hi-tech carbon fibre electronic shifting equipped bicycles at Eurobike, Pashley’s Guv’nor is a real standout. Hand-crafted in Stratford-Upon-Avon in Warwickshire, Guv’nor uses Reynolds 531 tubing with a tubular crown fork, in a lugged Path Racer frame that features a long stable wheelbase and relaxed steering geometry. Colnago Concept: Ernesto Colnago calls his new aero bike, introduced at the show, “The combination of pure power and speed”. The original Colnago Concept project was in 1986, Colnago’s first carbon fibre frame developed in collaboration with Enzo Ferrari. The newest Concept was designed in Italy after 41 variations refined from extensive wind tunnel testing, Colnago Concept is manufactured in Taiwan at Giant, one of cycling’s most sophisticated carbon fibre manufacturers. All cables are internally routed and two direct mount brakes are on a frame with clearances of up to 28mm. Colnago also debuted a new aero handlebar and stem with aero spacers. Like all Colnagos, the concept has a ThreadFit82.5 bottom bracket and claimed weight is 990g with a 400g fork. Look for the Colnago Concept in the 2017 in the World Tour with the new Bahrain team. A real retro show stopper at Eurobike was Colnago’s Arabesque, a new frameset shown last year and originally introduced in 1984 for Colnago’s 30th anniversary, the Arabesque was long gone from the Colnago’s catalogue. But then several years ago, a stock of the ornate one-off microfusioned cast lugs made to join the Gilco star shaped custom-drawn DT15V steel tubing and Prescia straight-blade chrome-plated fork were found in the bowels of the Colnago factory and presto! The Arabesque was reborn - at least until the lugs run out, which should account for about 500 frame sets. Updated with a one-inch threadless steerer tube, this retro-modern Colnago still uses an Italian-threaded 70mm bottom bracket. New-Old stock Campagnolo Cinquantanario groupset unfortunately not included. Campagnolo’s disc brakes are still Campy Tech Lab components and only used by pro riders in testing. Rumours say Campagnolo has developed these brakes with Formula and the caliper two-piston caliper with its two-piece body construction has a piston on either side of the rotor. Campy will supposedly offer discs in both flat mount and standard mount design. Campy Tech Lab brake lever looks like it has a integrated master cylinder with a taller and wider brake hood than Super Record mechanical and EPS hoods. The EPS shift paddle behind the brake lever on the EPS version is hollowed out for weight savings. Germany’s uber bike brand Storck was featuring one of their marquee models at Eurobike, the Fascenario.3, which features a “Nanocarbon Technology” PlatinumG1 carbon fibre frameset with aerodynamically efficient “Advanced Sectional Aerodynamic Shaping” and an aerodynamic fork. The 130g F.3 seatpost uses “Flat Section Technology” for enhanced comfort. Founder Markus Storck told us: “We want the Fascenario.3 to be the best road bike”. Storck created a 77 bike limited edition Fascenario.3 for Aston Martin with SRAM Red eTap, THM crankset and brakes plus Zipp’s speedy 303 NSW wheels. How much, you ask? Only €17,777! 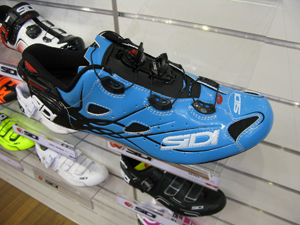 Gaerne G.Stilo +: Italian shoe-maker Gaerne has updated its popular G.Stilo shoe for 2017, with a new lightweight (275 grams for five 42) version called the G.Stilo +. Wear-tested by Team Lotto-Soudal, the Gaerne G.Stilo + has a well-ventilated cutout upper, and features two new new BOA IP-1 closures and an all new injection-molded heel cup. G.Stilo + eliminated the front velcro strap and adds an all-new carbon EPS lightweight full-carbon sole. Italian component brand DedaElementi has dabbled in wheels for a few years, gaining accolades for its solid, no-nonsense hoops. For 2017, DedaElementi’s wheels feature an all-new freehub design with three independent pawls for quick engagement and improved force transfer. DedaElementi has improved and upgraded its carbon rims and made them 20% stiffer with a wider, more aerodynamic profile. DedaElementi wheels will be available in 30mm, 45mm and 88mm depth. For 2017, DedaElementi Wheels feature an all-new rear hub with 24 spokes with a 2X1 pattern for more lateral stiffness, with the welcome edition of Enduro ceramic bearings.